I am back in action with a work out/ eating better routine. I posted about trying Barre Class a while back and really loved that workout. However, I wanted to be able to try more classes with more schedule options so I decided to join my local YMCA. I tried Yoga Fusion the other day and loved it! Today I wanted to explore the pool. So I ran a few miles on the treadmill and headed to the pool. I have always been a water lover; I was on swim team and a lifeguard [Shout out to my Trails Pool Sharks]. However, I haven’t swam laps in probably close to 8 or 9 years. It was back in college and I definitely didn’t do it on a regular basis. So I busted out the speedo I wore on swim team [AKA vintage speedo because it is 15+ years old] and my goggles and I was ready to go. 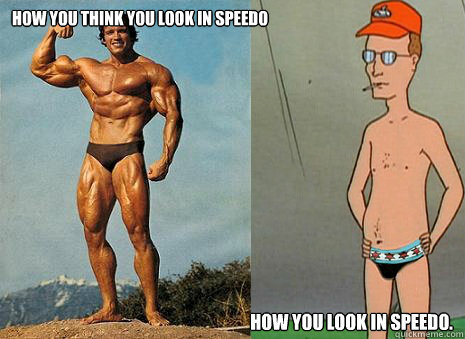 Side note: why are speedo’s so funny looking on my body. In my head I was going to swim a mile [32 laps at the YMCA]. And then I jump in and swam ONE lap and thought HOLY &%$@ this is WAY harder then I remember! Where are some floaties when I need them??!?!! However, I took my time and did 16 laps and felt good about myself. This has definitely shown me how I need to adjust expectations but also push myself. I am enjoying trying new classes and getting back into old fitness habits! What are your favorite classes and fitness routines? Aww, the Trails Pool Sharks! Those were the days you cute little red head! I’m doing Zumba and Bokwa 4 nights a week. It’s so hard but I love it! Now swimming…I might drown.